The MasterConsole II is ideal for mid-size and larger data centers that need a KVM switch that can access and control up to 256 servers with cascaded units by a single user. Up to six user names and profiles can be stored for ease of use. With Raritan's Master Console II kvm switch control from 4 to 16 servers, up to 256 servers by cascading units. Add a user up to 300 meters away with easy-to-manage Category 5e UTP cable and Raritan's built-in Cat5 Reach® technology. Enable growth with Raritan's award-winning, Cat5e-based Paragon KVM switch for enterprise-class server management. The kvm switch MasterConsole is engineered for dependability. Has a dedicated, intelligent processor at each port so each connected server "sees" its own keyboard and mouse, preventing lockup. Ensures nonstop server operation in case of power loss to the switch with Raritan's unique "keep-alive" design. 2-user kvm switch: MasterConsole MXU2, lets 1 to 2 users control up to 128 servers with cascaded units. Includes built-in extended access capability via Cat5e cable up to 300 meters (with model URKVMG receiver at remote workstation). Stores up to 120 user names and profiles. 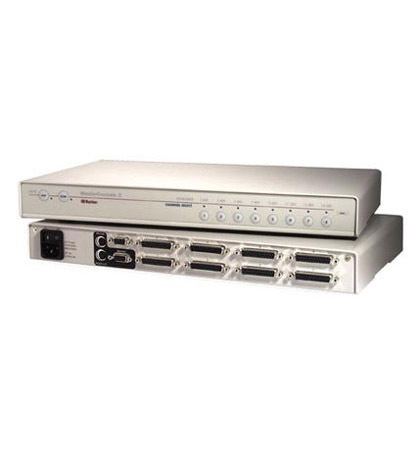 4-user kvm switch: MasterConsole MX4, Lets 1 to 4 users control up to 1024 servers with cascaded units. PublicView feature enables 2 or more users to share video. Stores up to 60 user names and profiles.